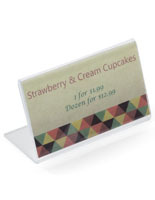 Sign channel holds thick card stock up to 1/16"
This table sign holder, acrylic base, is used in restaurants and other dining facilities to promote menu specials. The simple design allows users the freedom to design graphics and signage to use along with this base. 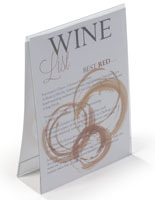 Each table sign holder, also known as a menu card display, holds signage up to 1/16" thick. Users should know that this base is not intended for use with single sheets of paper. 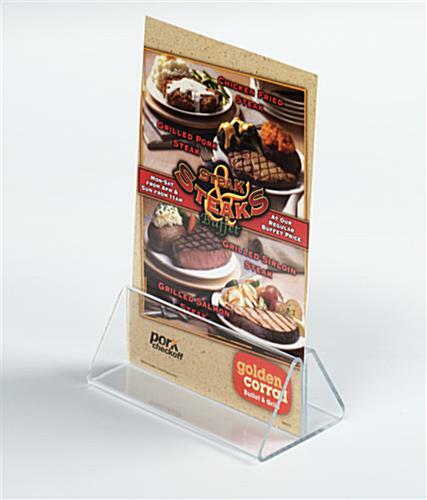 This clear clip base is the perfect table sign holder for casual dining facilities that regularly advertise on tabletops and bar counters. The unit is constructed with a single piece of acrylic that has been molded into the triangular shape. This table sign holder is suitable for use in any commercial setting such as; a hotel lobby, waiting room or reception area. 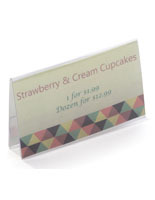 Use this signage base as a single or double sided display. 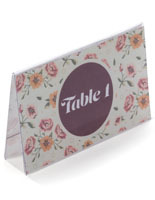 This table sign holder is 4" wide, 2"d, 1-1/2" tall. 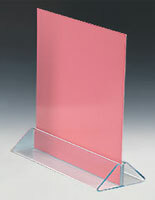 This clear acrylic table tent base holds a heavy stock card or laminated paper insert. 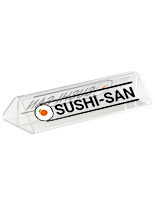 This table sign holder is easy to change out prints by simply pulling the graphics out through the channel. 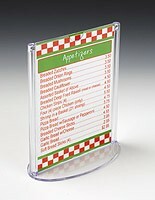 This signage clip is great for displaying 4" x 6" graphics, however slightly wider signs will also work with this unit. 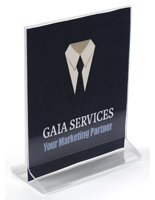 This table sign holder is customizable with logos or company slogans. Please Note: Acrylic is .080" Thick. 6.5" x 3.3" x 20.0"